Exclusive resort: El Gouna holidays are often the first choice for rich Egyptians as well as tourists seeking slightly more sophisticated holidays in Egypt. That’s largely because El Gouna is an ultra modern resort with a very stylish marina. Dive sites: El Gouna holidays have a good selection of dive sites, which almost come as standard on holidays to Egypt and the Red Sea. The best two are Abu Nuhas and the shipwreck of Rosalie Moeller. Sites such as these attract a fantastic variety of sea life, so you can expect to spot everything from angel fish and clown fish to whale sharks and dolphins. 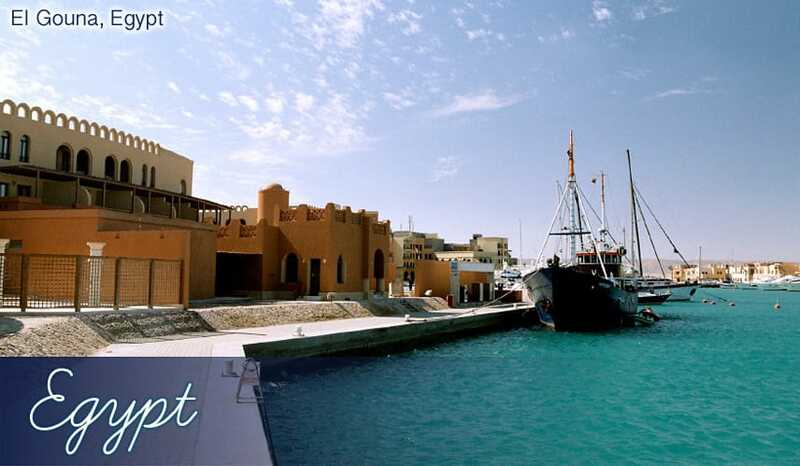 El Gouna Museum: This modern museum houses some of Egypt’s rich historical artefacts from the times of the pharaohs. With statues, stones and musical instruments, this small museum is worth a visit, especially considering some of the exhibits are over 4,000 years old! El Gouna Golf Course: This 18-hole championship level golf course was designed by Fred Couples, making it a top choice for golfing holidays. The perfectly flat plains of the fairways give you great views of the pretty marina, and the greens are maintained to a very high standard. Mangroovy beach: Considered the best beach in El Gouna for kite-surfing holidays, the strong winds out to sea create the perfect conditions for this fledgling sport. Those of us who prefer to relax a little more on their holidays will appreciate the soft golden sand and warm clear waters instead! Zeytouna beach: Zeytouna is actually a little further out to sea, based on its own little island. It’s an idyllic spot with plenty of activities to keep you busy on your holidays in El Gouna – everything from beach football to volleyball is ready for playing here. There’s also a 400m long jetty for easy access to the best sections of the sea where all the vibrant corals and colourful fish are! Hedra: This classy seafood restaurant serves incredibly fresh fish, and is highly regarded as a result. Try the salt baked sea bass or the crispy fried prawns for a true taste of the Red Sea. La Scala: A rustically styled Italian restaurant based by the sea. Their authentic menu includes classic dishes like spaghetti marinara and pesto chicken. White Elephant: You’ll appreciate the impeccable standard of service at this traditional Thai restaurant. They serve a variety of dishes on their menu, using fresh locally sourced ingredients. Try the creamy yet spicy Green Curry or the classic noodle dish Pad Thai. Stylish bars: In general El Gouna holidays have a very sophisticated, exclusive atmosphere and this is no different in the nightlife here. The bars here are often small and intimate, adding to the romance of the area and the beautiful sea views of the marina. It offers great holidays for couples, and places such as the Sand Bar and Boxers Bar help highlight this. And if you fancy a flutter while you’re on holiday, why not visit the Aladdin Casino? Even if you don’t want to gamble, the glamorous surroundings make it an attractive place to drink some fruity, colourful cocktails. Kafr El Gouna: The most exclusive area of this already exclusive resort, Kafr El Gouna is where you’re most likely to find the higher-end offerings from the retail world. The stylish boutiques sell original, handmade clothes which you won’t find in any other holidays in Egypt. That’s not to say everything here is high-end, and the Kafr El Gouna arcade’s cheap and cheerful shops will satisfy your need to discover a bargain on your holidays!